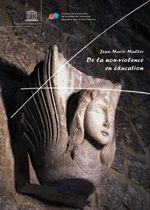 79-page pdf manuscript published in cooperation with Institut de Recherche sur la Resolution Non-Violente des Conflits (IRNC), of which the author says, “These pages do not claim that merely placing the principle of non-violence at the heart of the educational project could be enough to solve them with ease. It is not our intention to teach teachers how to do their job. Our only aim is to urge them to look at their daily practices in the light of the principles and methods of non-violence. Perhaps we can all agree that when non-violence is possible, it is preferable. If so, and if non-violence is preferable, then it is up to us to do everything we can to make it possible. This study does not claim to be offering anything other than an exploration of the possibilities of non-violence.” English translation of original French work.